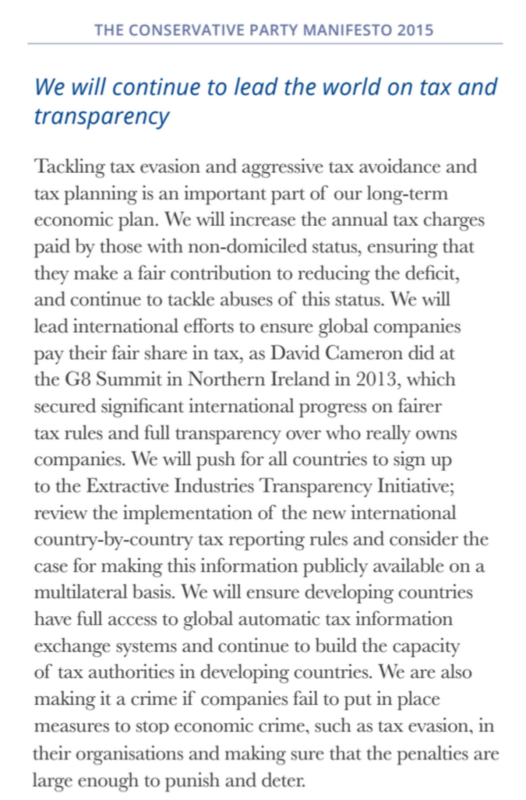 The new UK government comes to power with what is probably the most ambitious package of international tax commitments of any elected party, anywhere, ever. And Prime Minister David Cameron has been absolutely explicit that they will deliver on their promises. So, in the spirit of public service, and of this blog in making sure things don’t go uncounted, here’s a cut-out-and-keep guide to each of the three main commitments on international tax and transparency, and some proposed measures of progress. This entry was posted in Follow the Money, tax and tagged BEPS, CbC, corporate tax, financial secrecy, Follow the Money, international tax, OECD, tax, tax competition by Alex Cobham. Bookmark the permalink.